This is close to not being a wargames related post, but it is one of the major painting experiments I've been working on for the last week or two. 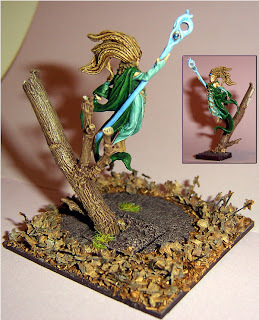 Produced for an online painting competition of Warhammer.org; the theme was 'A kind of Magic'. I decided, that as I couldn't really do off-source lighting effects well, I'd pull an optical illusion and do levitation instead. 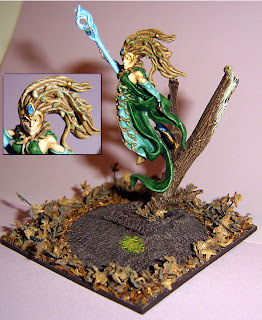 A nice model, giving a good sense of movement, but I didn't like the obvious physical attachment to the ground. So I removed all that and replaced it with a more discreet fixing to a nearby tree stump. After a lot of drilling and cutting, and even more painting she was as finished as I'd get her. Then it was to the display base. The Idea was to have a circle of ground being blown clear of detritus, as the force of magic keeping her aloft spread out - ground effect magic! This shows all I've learnt in the last 9 months with acrylic paints, and the last 15 or so using an online painting forum. The pastel blending on the staff, the washes on the leaves and hair, the colour matching was all beyond me this time last year. 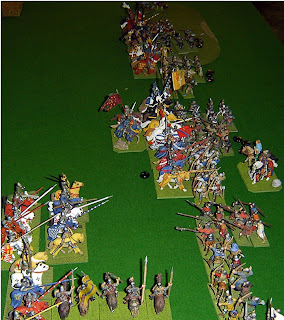 So last week, I had a game of Armati at the club; once again probably the last big game I'll get for a while. 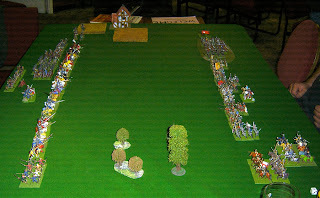 A French army of some 130 foot and 40 horse faced around 150 English foot and 20 horse; well over three hundred models filled the little club table. 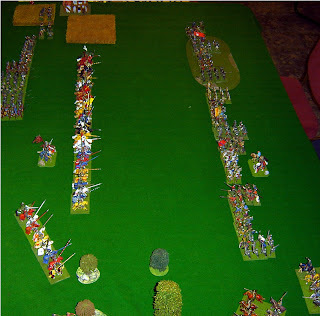 Chris commanded the English and with a little advice deployed in the classic English formation of bowmen interspersed with heavy infantry, and a small flank guard of Sergeants and Knights. I as the French opted for similarly classic lines, i.e. cavalry to the front en-masse, infantry lines to the rear and the left. Thick lines of French infantry back up the knights. Figures include Games Workshop, Essex, Blacktree Designs and Prince August. English Billmen. 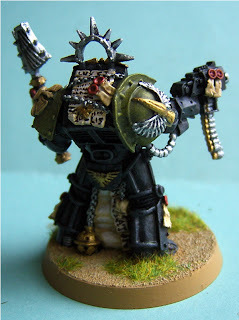 Games Workshop 5th edition Bretonnians. 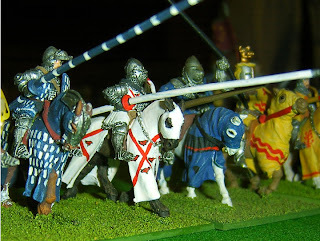 French knights, Foundry and Essex miniatures. English mixed lines. 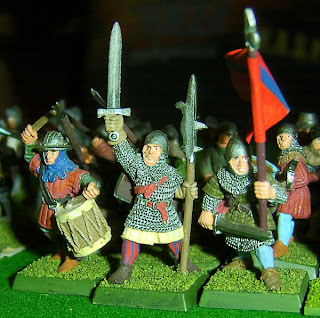 Bowmen by Irregular and men at arms from Foundry and Copplestone castings. 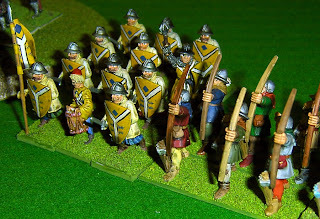 Flemish allies and English longbowmen. Essex and Games Workshop figures respectively. Anyway. The battle itself. 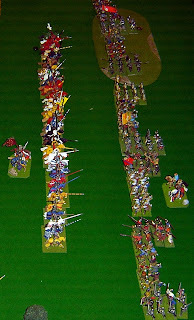 Being Armati, it was a fast affair, less than two hours to set up and play, despite the size of the forces. 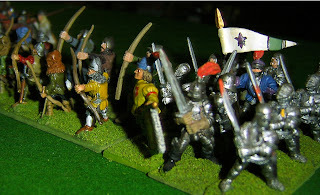 The French essentially charged the English lines to minimise the effect of massed archery. 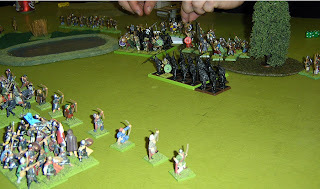 They were spectacularly lucky on their first turn to take only one hit from the bowmen. Wood on the right hampered their supporting mounted men at arms, but not seriously. However the English were able to manoeuvre their limited cavalry reserves to threaten the advancing French flank. And as the cavalry approached more casualties were suffered. 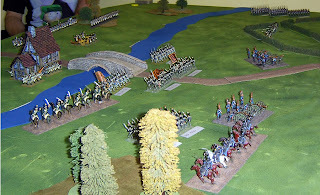 Elsewhere the French infantry halted to support their Genoese crossbowmen. And in doing so, it smashed the English lines, causing several routs. In return one unit of knights was destroyed. The French reserves were able to counter the flank attack of the English Sergeants, who were unable to do more than stall the French knights. And soon it was all over. To many English formations broke, unable to do more than slow the initial tide of the attack. The French eventually beat the English 8-3 on unit losses with a requirement to Break 7 units to win and have 5 of their own broken to lose. Yes, that means I won. Finally, a bit of luck. Well I think by now you should be able to guess the ending, but it was a much improved performance over the last outing for my Franks. 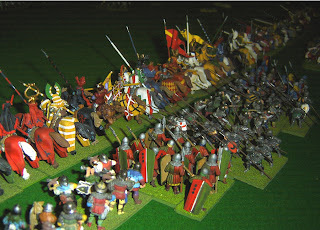 2000 points centred on a large unit of mounted knights and two units on foot. The rest of the army is there purely to screen and flank this force. Deployment showing the screen readied. As you can see all the terrain favoured my opponent; and so my game plan was to hold back and force him to advance. This actually worked, to a point. Some of my opponents Vikings, always a tough opponent. The Vikings in Warhammer are not unbeatable, but they are a tricky force with many tricks up their sleeves. Competently painted, though not everybody was finished. In the actual battle, the Vikings had to manoeuvre around the wood and lake to approach me. Though he could easily win the shooting match my skirmisher screen was reasonably effective in neutralising his bow fire. Crucially this meant he could not target my heavy units and cause a cheap retreat. I managed to charge the unpainted unit who chose to run, causing the larger unit behind them to run too; gutting his centre. 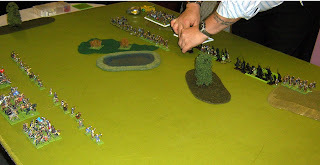 I then made contact with and wiped out another unit with only a couple of losses on the cavalry. 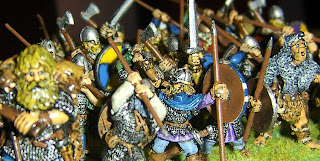 On the left his viking general contacted my foot milites. The milites held their own, killing his general, but his Godi kept the unit in contact, in fact it took the cavalry arriving to finally break them. But by this point, unassailed, his two retreating units had rallied and returned to the field. This left me over stretched and seriously outnumbered. Though he had no reply for the impact of my cavalry, he was able to avoid them mostly, and whittled down my infantry units until I reached break point. So it was all over, and I'd lost again; but My opponent at least agreed I'd given him a bloodied nose for it. Moreover I'm finally making the Frankish army work for me; yes it is a delicate balancing technique as the forces are so expensive, but get it right and they are quite effective. 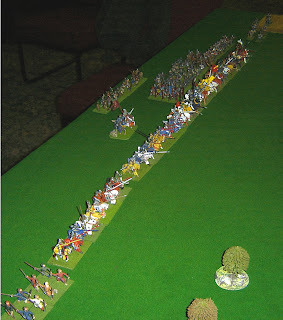 In simplest terms, one could simply play two or three units of a dozen to sixteen knights, each with a screen of skirmishers and simply steamroller most armies. But, then, where is the fun in that? The Prussians under Phil above for m a thin defensive line, they, unlike me were aware the river though wide and fast, was relatively shallow, and crossable along its' entire length. As such he couldn't risk denuding any areas. The cavalry line up on the open wing he correctly guessed would also suit my cavalry operations. The Dutch-Belgians present an aggressive centre, the cavalry tasked with scouting the river for crossings whilst the core of line infantry assault the bridge. The Belgian centre leads the advance. 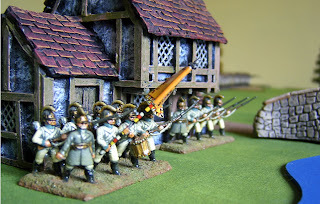 Austrians under Prussian command defend Toll-Bridge house. Initially the Belgians were extremely aggressive; playing Piquet rules, neither side can be sure of getting the initiative, but in the first turn I had all the luck and produced a sweeping attack. Then I had to endure three turns of almost no action whilst the Prussians thumped my lines with artillery. 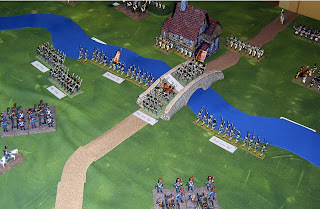 Then it went more or less my way again, and in a beautifully disciplined manoeuvre the Belgian centre opened out to cover the Bridge and the 2nd line moved into column to cross the river. 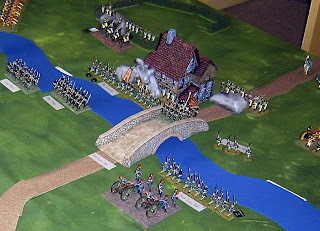 The Austrians rushed forward to defend the bridge. 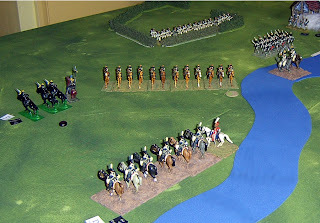 Elsewhere, my Dutch cavalry crossed the river; Prussian lancers prepared to charge, but were thoroughly beaten. However the Prussians had reserves where the Dutch had not, the situation soon replayed in reverse. 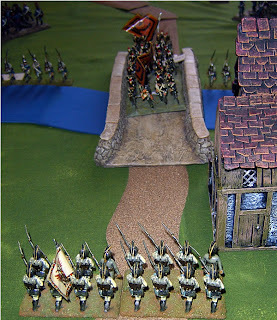 Despite their determination my hussars were also sent back over the river. At the bridge the battle was about to come to a head. The Austrians readied themselves and were able to get a number of volleys off in to the oncoming Belgians. The first Battalion was routed, but the second soon came on to the bruised Austrians. The Toll Bridge house also came under assault by eager Belgians who broke in and began an exchange of fire. 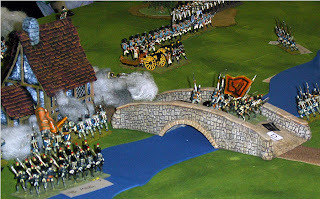 The critical battle was at the bridge, but luck favoured the Austrians. Though both sides suffered similar losses the Austrians remained ordered, whilst the Belgians broke. The Militia advancing over the river were not going to make much difference. By this time the ability of the Dutch and Belgians to maintain a cohesive command was lost completely, the attack had run out of steam. Overall a great game, but YET ANOTHER DEFEAT! In particular my dice seemed to only roll 2's be they D6 or D20's. I felt my plan was acceptable, but I was too eager in the centre, charging to contact when a more prudent commander would have reformed first. For the Austrians it was simply a case of weathering the piecemeal attacks, which never seemed to go my way and so never built up any real momentum. A word on the Scenery. The river is made from artists foam, and I keep meaning to paint it properly and texture the edges. However It is one of the best looking lazy solutions I've yet found for doing whet is the hardest piece of scenery to do well. For the photo's above though the joins have been potatoshopped out, it is in fact in 4-12 inch sections. The buildings are from the Javis Conflix range and are about £12-15 a piece - super lazy, painted in some anonymous factory in China; nevertheless they are quite well done and look the business. The Bridge is a Hovels piece, i painted myself. The trees and hedges are more Javis, from their model railways ranges. Well, as you may recall I'm trying to clear the painting table. 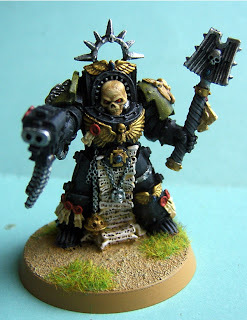 One of the items languishing on there was a Chaplain for my space marines. Well I finished him. 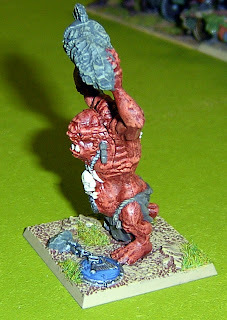 A flurry of activity also saw the goblins finished and the grotty Dreadnought spruced up enough to be presentable. On the other hand common sense prevailed around several oddments and they went in to storage instead. I was particularly happy with how the skull/helmet came out, about seven or eight layers from mid brown up to bone. The Thracians are well on their way too. The online dictionary I just referenced includes a definition of Byzantine thus: "...highly complex or intricate; convoluted legal language; convoluted reasoning; labyrinthine maneuvering; tortuous legal procedures". Well after the game I played last night I have encountered the very definition of that standard in rules writing. A chap at the Leeds club had brought his own set of rules, designed it appeared on the basis that he liked DBA/DBM but thought they could be improved upon, by adding more detail. Now in principle, DBA/DBM are simple rules, the problem is how their written. The same may well have been true of these rules but it was hard to tell as the prototype set appeared to be formed of a half dozen densely typed pages of text and hundreds of pieces of card stuffed between them. I will not say there weren't some good ideas on display, but times have moved on, rules with complex modifiers and millions of troop classes defined only by a name that then defines which modifiers you later apply, is not the way to make things elegant. It was also the first game I've seen use average dice in almost twenty years! Anachronistic touches aside, it used play aids that made the game harder to play than a simple tape measure and some common sense would have done. In short the kernel's of good ideas were swamped by fiddly detail. 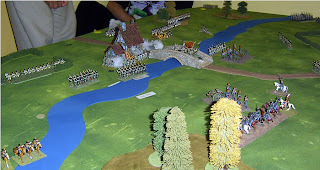 The game itself ran in a realistic enough fashion, some of the strong points were the way skirmishers operated, and the way troop control applied internal logic so the general couldn't over influence the battle. However , it was also terribly slow; combat was either over straight away or took forever. One combat took seven turns to accumulate a single overall casualty in either unit, and this would only effect the conflict by placing a minus one modifier to the combat factors, it may not even have effect the end rolls. Ultimately one felt that the tactic was 'Ties up the enemy centre and outflank it' to win. Historical enough but too obvious and programmed. 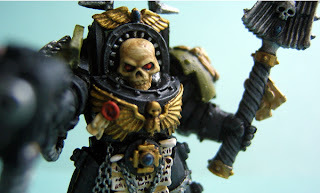 It was a shame, there is much that was commendable; but I think the writer would benefit from reading some Arty Conliffe rules, or even playing a few games of warhammer (non competitively) . They may not be what he wants from a game but as someone whose written successful and unsuccessful rules in the past I know that all other points aside, if you are the only one who understands how and why your rules work, you'll never get anyone else to use them. It's a blatant steal of a thread from the Grimsby Wargamer; but a very good one, and opportune too, as I'm in the middle of rationalising my collections and storing what I'm actually going to keep. Well, I'd split this into three periods really, Biblical, Classical and Imperial. 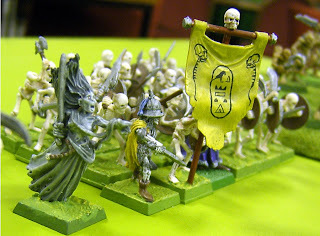 In Biblical terms I have a 15mm New Kingdom Egyptian army, fully painted and based for DBM. An opposing Phillistine army awaits attention. In the Classical period I have Selucids, Thracians, Maccabean to Revolt Jewish, Etruscans, and Early Republican Romans in 20mm to DBM strengths. In boxes sit another Successor Greek army and a Campanian (southern Italiot) army awaiting building. Then There is also my oh so nearly finished 28mm Spartans - 2000 points of WAB army; and a pair of 6mm DBA armies - Republican Romans and Numidians. 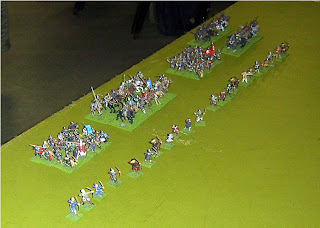 Lastly for the Imperial period I have a massive Early Imperial Roman army and a huge Celtic force in 20mm. 'Ancients ' are certainly some of my favourites to work with and study. Formally this is three periods too for me; Early Medieval (what we used to call the dark ages), High Medieval - from about 1100 to 1400, and the late medieval from about 1400 to 1550. Inside these realms is the bulk of my 25-28mm collections. 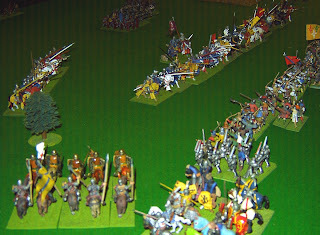 Starting with a 25mm Eastern Frankish (Ottonian) army, mainly painted badly some 20 years ago. 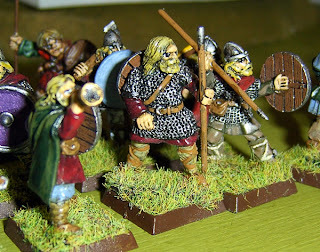 Then a rather nicer 28mm Viking army. Both around the DBM size of 200+ figures. Into the high meds and I have three large armies; all fairly recently painted and in 28mm: English, French and Flemish (Low Countries). The beauty of these is the number of other armies you can assemble between them; all told they total about 700 figures. The later period never really interested me; so is not covered; but that aside I love both the classic Hollywood 'shining armour and skintight hose' versions and the more accurate 'grimy' historical look and feel of the middle ages. I reckon this is 1550 to 1700 or so. 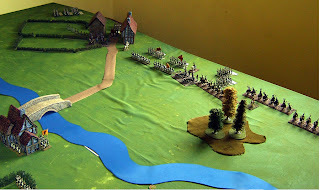 I can count on my 15mm English Civil War armies in this area. But I also have that damn pile of 500+ plastic samurai to get dealt with one day. My interests in this period are more limited, and the Samurai are to be honest more medieval than their date implies. Or 1700 to 1865 or so. Not an area I've really got into, and it's all down to the uniforms! I've dabbled in the past, but really painting piping and braids has always left me in the playing with other people's toys category on this period. 1900 to 1939: Really no interest. Plus I always found the idea of gaming WW1 a bit iffy. WW2 onwards. So many! For WW2 alone I have a large US armoured infantry force and tank company in 20mm. An Italian force for Tunisia and Sicily, Normandy/Italy period Germans, a small Japanese force too - all in 20mm and painted. Then there's the 28mm German and American platoon sized forces with a dozen vehicles each or so. Then of course there's the Axis and Allies ships - about 70 vessels now. World War Two was where it all started for me, as a boy growing up in the seventies it was in the movies and books(and let's not forget 'Battle' magazine) constantly. After WW2 there's Korea in 20mm, with large Chinese and American forces. Then there's Africa in 15mm, with 3 generic African armies and a UN force to cover 1970-2000. Lastly there's the Yugoslavian Civil Wars in 20mm - Croats, Serbs and a sprinkling of Bosnians. Some years ago I made a decision to stop doing anything current, and drew an arbitrary line at the year 2000. As discussed in the past, I've had issues about taste when it comes to making a game of the Gulf war and other current conflicts; To be honest the Yugoslav wars are something I have to address very cautiously, so as not to offend players, observers; or myself for that matter. More Warhammer; more Orcs. 300 or so of them and their Goblin chums. 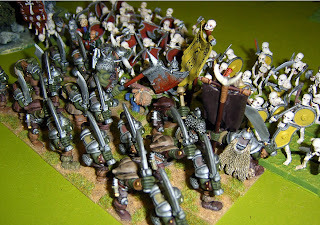 Additionally I have my Vampire counts army, and an as yet unpainted Dwarf army, looking to be a winter diversion. I blame Lord of the Rings for all my fantasy and roleplay gaming weaknesses. Yes, another tale of defeat. It's now been since July that I've gone without a victory in a game. Close to three whole months at a rate of nearly one game a week. I'd almost go so far as to say it was demoralising, but that may be too much. 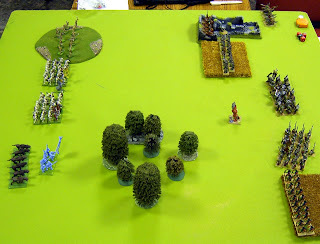 On Wednesday it was only a small matching of Warhammer, a mere thousand points a side; but the out come was the same. 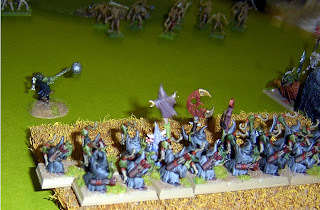 My Goblins of course never were likely to stand much hope against the undead, seldom a good pairing, but the only painted fantasy armies I have makes it the logical one. Battle began as shown above, with the goblins at least enjoying useful cover and a strong centre awaiting the enemy. Sadly when your enemy is the undead, your hopes are slim, without vampires, but instead with two mages who could seemingly summon more skeletons almost at will, it was going to be an uphill struggle. My troll advanced and made some headway, but not enough, ending up killed in a melee by a Necromancer, rather too skillful with his sword I fear. And so it was their masses smashed into my combat units. What hope did I have then? None whatsoever, I simply couldn't kill enough of them with my typically crappy Warhammer dice rolls. For example my Orc boss: three attacks at 3+ to hit, gets one hit, at Strength 6 2+ to auto kill, misses; then unit routs and he's rolled up and killed :-( . With the orcs gone the goblins held on just long enough to be surrounded and wiped out too. Awful, Awful, Awful. Was fun though; chin up! A US company - Viking Forge approached me a couple of weeks ago, having, via a circuitous route found out about my 1:1800 scale ship modelling. They wanted to know if I could do similar work in 1:2400. Not something I'd ever tried before. The above is the result, a sample model designed for casting and hence using brass parts in places. To be honest I don't even know if those masts will cast, but I do know the detailing is as good as I've managed in 1:1800, making allowances for the pressures involved in casting up models. The hardest part was the research though. The Norfolk went through several incarnations, and each time aspects of the superstructure were substantially changed. On top of that there were few high quality photographs of the ship available; most of those I could find were grainy and unclear. 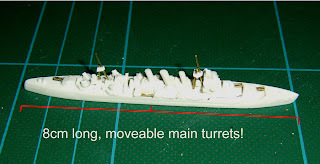 In the end I was able to assemble a reasonable version of the 1944 refit of the Norfolk, when one 8 inch turret was removed, and masses of 'triple A' replaced it. Hopefully the company will be impressed enough to order more, it's something I can easily do on an ad-hoc basis; and shortly it would usefully augment my income.